Dead Heat Riders arcade machine is a motorcycle racing game in which up to four players can go head-to-head to battle for first place. The game is based on the popular Dead Heat car racing games and the Riders version is the latest in the series. 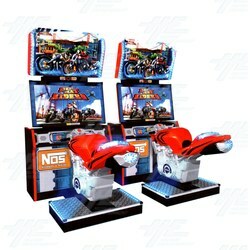 The cabinet features a large motorcycle shaped seat which players use to steer by shifting left or right, as well bright LED lighting, a 42" LCD monitor and amazing HD graphics! The cabinet also includes a 'NITROUS' button which gives players a quick super boost of speed for an exciting rush and a competitive edge. Each race, players get three nitrous tanks to use during game play. The game includes five original customized bikes to choose from and four super fun and challenging courses, based in the famous cities of San Francisco, New York, Chicago and London! The machine also uses the Namco camera system, the same as what's used in the car series, which takes a photo of the players before they start the race, and then during the game the photo is displayed above the bike the players are riding. This allows for a deeper sense of engagement with the game play and allows opponents to be quickly identified. Dead Heat Riders is an exciting new challenge for fans of the car racing series, puttin them on a new vehicle. This kind of machine works well in a variety of location, such as Family Entertainment Centers. The bright cabinet will draw players in from all across the floor while the thrilling motorcycle game play and motion control will keep players coming back time and again. Dead Heat Riders arcade machine is a motorcycle racing game in which up to four players can go head-to-head to battle for first place. The game is based on the popular Dead Heat car racing games and the Riders version is the latest in the series. The cabinet features a large motorcycle shaped seat which players use to steer by shifting left or right, as well bright LED lighting, a 42" LCD monitor and amazing HD graphics! The cabinet also includes a 'NITROUS' button which gives players a quick super boost of speed for an exciting rush and a competitive edge. Each race, players get three nitrous tanks to use during game play. The game includes five original customized bikes to choose from and four super fun and challenging courses, based in the famous cities of San Francisco, New York, Chicago and London! The machine also uses the Namco camera system, the same as what's used in the car series, which takes a photo of the players before they start the race, and then during the game the photo is displayed above the bike the players are riding. This allows for a deeper sense of engagement with the game play and allows opponents to be quickly identified. Dead Heat Riders is an exciting new challenge for fans of the car racing series, puttin them on a new vehicle. This kind of machine works well in a variety of location, such as Family Entertainment Centers. The bright cabinet will draw players in from all across the floor while the thrilling motorcycle game play and motion control will keep players coming back time and again. Multiplayer compatibility - links up to 4 players! 42" LCD monitor with HD Graphics! Four Famous City Tracks - London, New York, Chicago and San Francisco! NITROUS button for competitive edge!